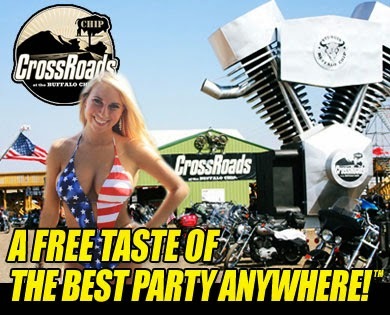 Sturgis, SD – The Sturgis Buffalo Chip’s free-access CrossRoads destination will host countless new events, activities and attractions during the upcoming 2014 Sturgis Rally. Five new bike shows will offer motorcycle enthusiasts the chance to see the best in custom bike building. In addition, CrossRoads guests may demo new 2015 Victory Motorcycle models, see new 2015 Indian Motorcycle models, and get an up-close look at the Budweiser Clydesdales and a newly released painting by David Uhl. This Sturgis Rally destination is home to multiple bars, nearly continuous live music on the Jägermeister Stage, dozens of world-class vendors, and a host of epic events, entertainment and attractions only available at the Buffalo Chip. There will be multiple opportunities to ogle hundreds of unique bikes on display Sunday, Aug. 3 through Thursday, Aug. 7 with six distinct bike shows. The “Winner Takes All” series of bike shows, presented by Sailor Jerry, start off the lineup of shows by offering the winner a $5,000 cash prize, and bike enthusiasts the opportunity to see some amazing custom creations. Baggers Magazine kicks it off on Sunday, Aug. 3, followed by Street Chopper Magazine Show on Monday, Aug. 4, Hot Bike Magazine/Top Builder Competition Show on Tuesday, Aug. 5 and Cycle Source Magazine’s Grease and Gears Bike Show Wednesday, Aug. 6. The king of all custom shows, The Rat’s Hole Custom Chopper Show, will cap the week of shows on Thursday, Aug. 7. CrossRoads guests will have the opportunity to take free demo rides on brand-new 2015 Victory Motorcycle models on the Chip’s newly paved roads and register for the chance to win the Buffalo Chip’s 2014 Sturgis Rider® Sweepstakes, a Cory-Ness-customized Victory Cross Country 8-Ball and matching Les Paul Studio Epiphone guitar. Victory owners are invited to join the Victory Owners Ride, enjoy a free catered reception and meet actor R. Lee “Gunny” Ermey. Indian Motorcycle will also be presenting its new 2015 models at the CrossRoads and giving visitors the opportunity to sign up to win a brand new 2015 Indian Motorcycle. Guests with Buffalo Chip wristbands are invited to top off their tanks with free fuel from the Renewable Fuels Association (RFA), Tuesday, Aug. 7 through Thursday, Aug. 9 from 1 to 4 p.m. with Free Fuel Happy Hours. RFA will fill riders’ motorcycle tanks for free with 93 octane E10 (10% ethanol, 90% gasoline) and answer any questions about which blends of ethanol can be used in motorcycles and other engines. The Buffalo Chip's 23rd annual Freedom Celebration, held on Thursday, Aug. 7, will include a full day of powerful presentations, inspiring performances and moving exhibits. For the first time, festivities will also include a special charity ride, sponsored by the City of Spearfish. The event concludes at the CrossRoads with a host of meaningful events planned to honor those currently serving, those who have served and those who have fallen. A towering v-twin engine welcomes riders and curiosity-seekers to the CrossRoads, which opens in mid-July each year and welcomes guests through mid-August. The destination is also home to an impressive display of nearly 1,000 American flags, Battlefield Cross Memorial and American Veterans Traveling Tribute Memorial Wall. The CrossRoads features endless shopping, dining and fun events. Professional freestyle sport-bike stunt rider, Clint Ewing, will be doing wheelies, drifts, burnouts and acrobatics Aug. 2-9 at 4:30 p.m., and Sturgis’ hottest gals over 35 will be strutting their stuff during the Sassy and Classy Over 35 Model Search on Wednesday, Aug. 6, 1-3 p.m. The baddest babes in Roller Derby will be battling it out on the CrossRoads track each day at 7:30 p.m. The world-famous Budweiser Clydesdales will stable at the CrossRoads during the 2014 Rally. Guests can get an up-close look at these magnificent horses in their special corral and occasionally hitched, pulling their stately Studebaker beer wagon through the grounds. Visitors are welcome to take photos and visit with handlers. World-renowned painter, David Uhl, will be presenting the newest in his Steampunk Series, “The Huntress,” featuring “Buffy” actress, Kristy Swanson. Uhl and Swanson will be signing prints at UhlWorks’ CrossRoads booth. In addition, Black Hills Gold by Coleman’s line of Buffalo Chip Black Hills Gold jewelry, HP Custom Silver, Katus Jack’s Hats, BikaChic, and Leather Creations can all be found exclusively at the CrossRoads. CrossRoads’ food vendors, Lotus Up Espresso, Pie for the People Pizza, Old Skool Concessions, Santa Lucia’s Buffalo Chip Big Bite and the Sons of Light Ministry free pancake breakfast will offer guests an infinite variety of dining options. Guests can wash it all down with several ice cold drink specials from the CrossRoads bar including two Buds for only $6 and the famous “Deers and Beers” special, two shots of Jägermeister and two Budweisers for only $16. The Sturgis Buffalo Chip is known as the center of the annual Sturgis Rally. The world-class concerts, nearly 600 acres of camping and entertainment, hundreds of vendors, restaurants and bars, weird and wonderful contests, military tributes, and signature rides and events have made the venue famous the world round. The CrossRoads was created just outside the west entrance of the campground in an effort to open wide the doors to those who want to experience a free taste of the Chip. For the full rally experience, passes for the Largest Music Festival in Motorcycling™ may be reserved online at www.BuffaloChip.com or by calling 605-347-9000.